For anyone who's ever wondered how the Princess Bride ended up with an English accent or what Julia Roberts wore to the audition for her first major role -- or for anyone who's ever walked out of a movie saying "I would never have put that guy in that part" -- here is a first-of-its-kind look at how actors are chosen and careers are born. Two of the top casting directors in the business, who have cast everyone from the Harry Potter kids to the new James Bond, offer an insider's tour of their crucial craft -- spotting stars in the making. Recounting their remarkable shared career that started at Francis Ford Coppola's Zoetrope studio, Janet and Jane tell the funny and fascinating stories of discovering and casting then-unknown stars like Julia Roberts, Tom Cruise, Leonardo DiCaprio, John Cusack, Matt Damon, Winona Ryder, Jennifer Connelly, Brendan Frasier, Virginia Madsen, Joaquin Phoenix, Meg Ryan and Benicio Del Toro, as well as share insights about the many famous directors for whom they've worked. 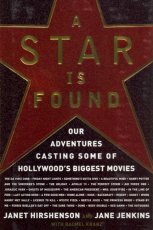 Taking us from the first casting call through head shots, auditions, meetings, and desperate searches to fill a part, A Star Is Found gives readers behind-the-scenes access to the machinery of star-making.